Reliving the past and “time traveling” are widespread pastimes in early twenty-first-century society. Increasing numbers of people enjoy first-person interpretation at historic sites, they reenact historical events, they engage in creative role-play inspired by historic scenes, they submerge into virtual realities through cutting-edge digital technologies, and they enjoy being titillated by themed environments and historical docu-soaps evoking past realities. Although some of these fast-developing phenomena are firmly situated in the entertainment industry (e.g. computer games, movies, theme parks), academic discussions about all these trends have often been based on an educational paradigm. Of particular interest to scholars in disciplines such as history, archaeology, museum studies, and heritage studies has been whether novel genres of appreciating the past advance accurate learning about the past or whether they distort historical understanding. For example, when historians Timothy Compeau and Robert MacDougall of the University of Western Ontario, Canada, set out to develop an innovative augmented reality game with a strong historical theme they were asking educational questions such as “Could we design a pervasive game that taught genuine historical thinking? Could we bring a large group of players into a sustained, evidence-based encounter with the history around them and so awaken them to the pervasive presence of the past?” (Compeau and MacDougall 2010: 3). For other, far more traditional professionals the ideal of historical accuracy rules to the extent that it is anathema even to consider that serious presentations of the past might, or should, in some way be theatrical or playful. Anja Dreschke’s ethnographic documentary Die Stämme von Köln (The Tribes of Cologne, see also Dreschke 2010) investigates an association of about eighty societies, known as tribes, with over 3,500 members who are all based in the German city of Cologne. They share a commitment to imitate during their leisure time various foreign or historical peoples. Impersonating Romans, Vikings, Native Americans, Scots, and notably Huns and Mongolians, the tribal population spends a lot of their spare time throughout the year manufacturing elaborate costumes, tents, and other artifacts (Figure 1). Entire families spanning three generations can take part in this hobby as well as groups of neighbors or co-workers. Their hard work is displayed and some of their skills are publicly demonstrated during carnival parades but especially during annual summer camps staged by the tribes within the city boundaries. At these camps, the tribes welcome visitors while selling beer and barbecued food, occasionally employing DJs and performing elaborate role plays, staging for example the life at the court of Attila or Genghis Khan. Fig 1. The First Mongolian Horde of Cologne (1. 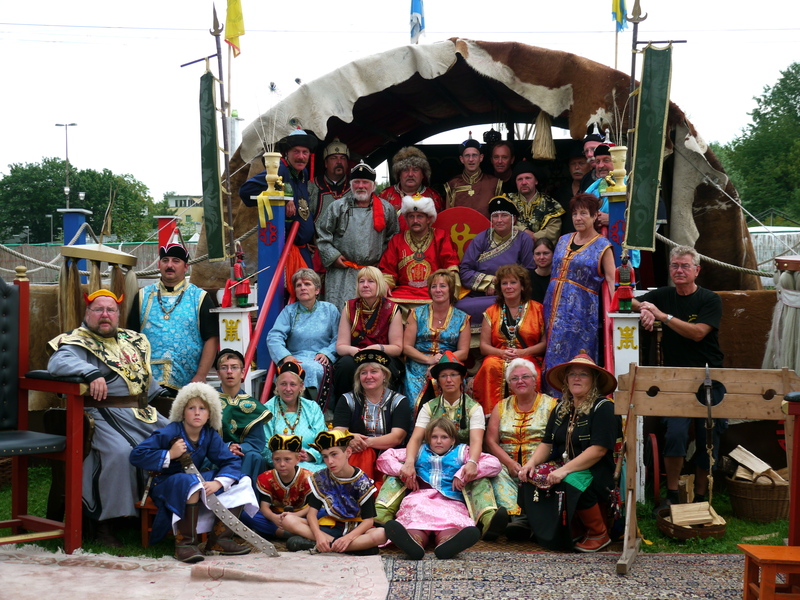 Kölner Mongolenhorde) at their annual summer camp. Photo: © Anja Dreschke 2010. Used with permission. Over the past 15–20 years the tribes gained in popularity and both membership figures and the number of tribes expanded considerably. The inspiration includes documentaries, fiction, museum exhibitions, academic literature, and historical sources. Oddly, the first tribe imitating the Huns was based on the 1954 Hollywood movie Sign of the Pagan starring Jack Palance as Attila. Popular culture still provides a lot of inspiration, complementing the more academic sources. One particularly memorable moment of Dreschke’s film is the enjoyment among some Huns of the pop song Dschingis Khan, which in 1979 topped the German charts for several weeks. Anja Dreschke is a social anthropologist and filmmaker who accompanied the tribes of Cologne over several years, observing their practices and interviewing some of their members on video. In her film, she shows how academic knowledge about the past is significant to the tribes insofar as it enhances their experiences, e.g. by inspiring the design of their clothes. But the key concepts on either end of the spectrum within which the tribes are operating are not academic truth and falseness but played and lived reality (Figure 2). At one level, the past is a game, a form of superficial imitation and playful entertainment that may be amusing and enjoyable for participants and audiences alike. Under the sign of “PLAY” the past is being staged somewhat tongue-in-cheek and concessions to the present are willingly made for the sake of added fun. In the film you learn how some supposedly exotic artifacts that have their origin at local flea markets are nevertheless acceptable because they somehow look the part. You see shamans performing ceremonies and trance-inducing rituals that are based only in parts on academic knowledge about the people being imitated and otherwise on the tribes’ own traditions. Quite clearly, a good part of what the tribes are into has clear carnivalesque overtones, and this is of course no coincidence. Fig 2. A framework for understanding contemporary time travel. The past as a form of lived reality, on the other hand, is a heartfelt and sincere attempt at effectively transforming the present into the past. Under the sign of “LIFE” the past assumes a new authenticity in lived experiences of the present. In the film, tribe members do not only write elements of their new lives as tattoos into their own bodies but they also assume new identities that will stick to them “until death,” even in their everyday lives. A man playing the prestigious role of Attila states that he “lives” this role in all aspects of his life. A modern Viking suggests that “you cannot become somebody who was not already in yourself.” A woman who assumed the role of Amalasuntha, Queen of the Ostrogoths, told Dreschke (2010: 254) that once infected with the “Hun virus” it was like being possessed. Some members are traveling to the countries in which their tribes originate in order to get first-hand ethnographic knowledge and buy original costumes or other artifacts. For example, one tribal couple brought an original Mongolian yurt all the way to Cologne to serve as their summer house. Other members are content with the occasional presence in their tribe of local immigrants from the cultures they are imitating. In the film, a Mongolian woman admits that she wore traditional Mongolian costumes in Cologne for the first time. Significantly, the tribes of Cologne are part of the Cologne carnival tradition and trace their roots back to the nineteenth century (Dreschke 2010: 256–8). During the short period of the carnival every year, current events are commented on and the dominant structures of society are subverted through masquerades and parody. Arguably, one of the desired outcomes of the carnival is that the normal social reality can safely exist during all other periods of the year. By the same token, the tribes of Cologne may be said to evoke the past during their summer camps so that the present can rule for the rest of the year when the game is off. Dreschke’s film Die Stämme von Köln does, however, put a number of big question marks behind any such simple interpretation of the tribes’ use of the past. It becomes clear that at least for some of the members in the tribes the past is very real even during other periods of the year. The film thus blurs the boundaries of some all-too-familiar oppositions. This is not simply a carnival phenomenon in which normal life in the present is substituted by amusing role-play evoking foreign cultures. We see something altogether different here: a genuine concern with lived past realities that is largely situated in popular culture and outside the academic context, and a highly original notion of the authentic past that is both linked to playful carnival and deeply felt in many of the participants’ own lives (Figure 3). Fig 3. 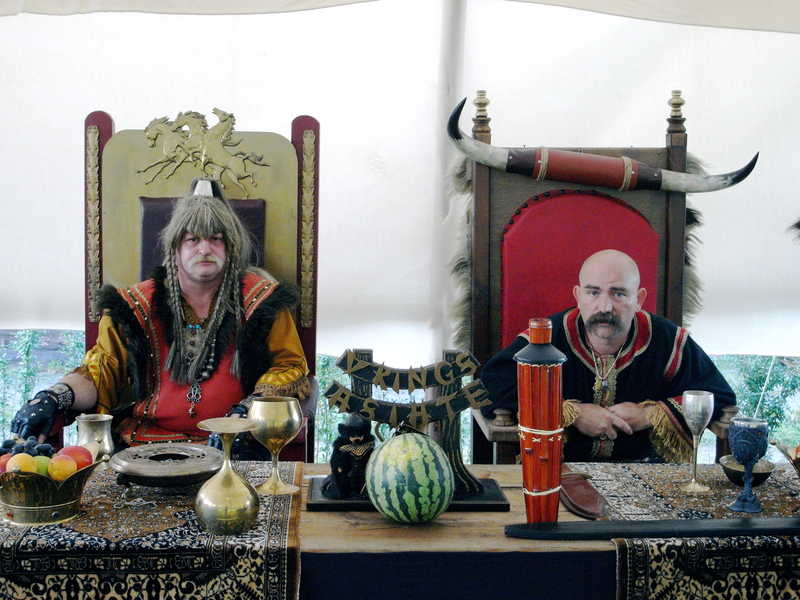 King Rugula (left) and King Mundzuk (right) of the Hun Tribe “Vrings Asiaten” at their summer camp. The two characters are played by taxi driver Jürgen Piefer and DJ Adi Rath respectively. Photo: © Anja Dreschke 2007. Used with permission. All this indicates that an educational paradigm alone is not able to do justice to the full range of phenomena in which the past receives meaning in the present. Playing games and having fun about the past cannot be reduced to whether or not you learn any history in the process. There are strong aesthetic, political, and ideological dimensions in such played realities and they demand our attention (Holtorf 1998). The social anthropologist Petra Kalshoven (2010: 59) cited Friedrich Schiller’s insight that one is only fully a human being when one plays. She argues that play is a category of social life that deserves to be given much more attention, not the least because it is the counterpart of seriousness which is so prominent in modern life. Reconstructing past life as accurately as possible is not necessarily a strong motivation of playing the past for participants and audiences alike. Many people who enjoy living (in) the past do not care too much about historical accuracy, although there are certainly exceptions to that too. Often, escaping the present does not make the past attractive to be re-lived either. Indeed, ethnologist Michaela Fenske (2007) argued with reference to historical docu-soaps on television, that playing the past offers participants and audiences alike spaces in which they can behaviorally, sensually, and cognitively engage with issues that are actually of particular relevance to present society. Discovery Channel’s documentary Curiosity: I Caveman (2011) provides a good example. Ten adults were filmed as they attempted to pass (in the words of the film’s narrator) “the ultimate test of survival” by living 10 days under Stone Age conditions, “totally cut off from the modern world and deprived of the most basic human needs!”. The agenda however was far from historical and explicitly concerned with the present day. The adventure was presented as “an effort to discover if the modern world with all its cities, supermarkets and cell phones helped us or harmed us as human beings.” With its focus on the simple life, basic human needs, frictions in the group and adventures in nature, the documentary endeavoured what it means to be human, past and present. What becomes obvious in this statement but is sometimes forgotten among the professional experts of the past is that behind the appeal of re-living the past often lies a utopian desire to explore how life might, or should be, in a better, future world. Paradoxically as it may sound, the past becomes a surface for projecting hopes, dreams, and aspirations for the future. Indeed, many time travelers ultimately seek to find nothing but their true selves in the past so that they can live it in the future. This future orientation of living the past gives phenomena like the tribes of Cologne a particular pertinence and social relevance. Dreschke’s film is thus not only an ethnographic exploration of one playful form of living history but it also makes a profound contribution to exploring where present-day society might be heading. This is a revised version of a paper previously published as Holtorf, Cornelius (2012) Review Article: The Past as Carnival. (Review of A. Dreschke, dir., Die Stämme von Köln, 2010), Time and Mind 5(2), 195-202. Compeau, T. and MacDougall, R., 2010. “Tecumseh Lies Here: Goals and Challenges for a Pervasive History Game in Progress.” Paper presented at the Playing with Technology in History Conference (Pastplay), Niagara-on-the-Lake, Canada, 30 April 2010. Retrieved on 12 November 2011 from http://www.robmacdougall.org/pdfs/compeaumacdougall2010tecumsehredacted.pdf. Dreschke, A., 2010. “Playing Ethnology,” in J. Schlehe, M. Uike-Bormann, C. Oesterle, and W. Hochbruck (eds), Staging the Past: Themed Environments in Transcultural Perspectives. Bielefeld: transcript, pp. 253–67. Fenske, M., 2007. “Geschichte, wie sie Euch gefällt—Historische Doku-Soaps als spätmoderne Handlungs-, Diskussions- und Erlebnisräume,” in A. Hartmann S. Meyer & R-E. Mohrmann (eds), Historizität. Vom Umgang mit Geschichte. Münster: Waxmann, pp. 85–105. Kalshoven, Petra T. 2010. Things in the Making: Playing with Imitation. Etnofoor 22(1): 59–74.